The Bushtown Hotel host the very best in Irish Country music scene every Monday night and bill ourselves as The North Coast’s Premier Monday Night. Several times through the year the hotel organizes a country festival running 2 nights of country music with special accommodation rates. Outside of this, we provide complimentary music in the hotel foyer on a Saturday night from 9.30pm to 11pm. May Country Festival & Cabaret Dance. Jordan Mogey and Tracey McAuley & The Bar Room Buddies with Country Harmony. 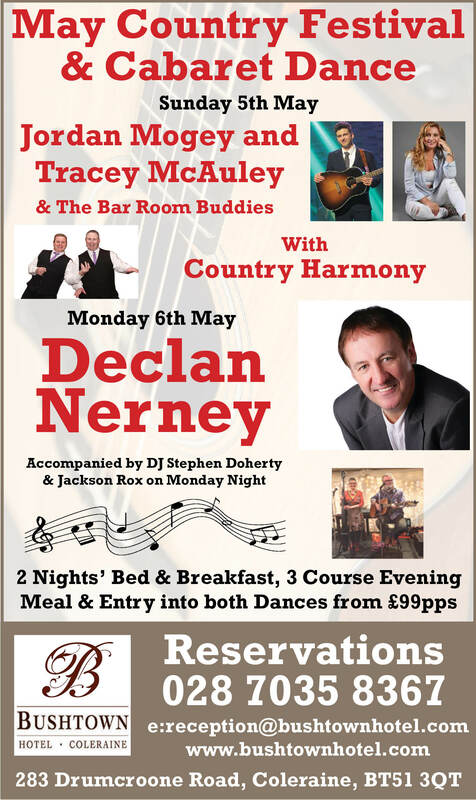 Declan Nerney accommpanied by DJ Stephen Doherty & Jackson Rox on Monday Night.